The 1980s saw widespread political violence and countless forced disappearances in many countries in Latin America, and Honduras was no exception. Hundreds of political opponents of the 1980s U.S.-backed regime were kidnapped, tortured, and assassinated by the CIA-trained secret army unit Battalion 316, while at the same time Honduras served as a military base and training ground for U.S. counterinsurgency strategy in the region, especially in neighboring El Salvador and Nicaragua. With the Reagan Administration turning a blind eye to the brutality of Battalion 316, intentionally downplaying or denying its violence in order to continue backing Honduras financially and using the country as a key U.S. military outpost, the details of this death squad’s operations did not become clear until years later. A historic expose published in the Baltimore Sun in 1995, which included interviews with ex-Battalion 316 torturers and details from declassified U.S. government documents, revealed the full extent of the secret unit’s atrocities and its close links to Washington. 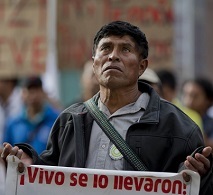 However, torture and disappearances aren’t just a tragic reality of the past in Honduras. Human rights defenders have drawn disturbing parallels between Battalion 316 and the present day situation in Honduras, saying the current level of human rights abuses and political repression is just as bad, if not worse than the era of forced disappearances in the 1980s. In the wake of the 2009 U.S.-backed coup ousting democratically elected President Manuel Zelaya, forced disappearance, torture, and targeted assassinations re-emerged as state terror tactics to intimidate and repress a broad-based resistance. Conspicuous and even conscious links to 1980s tactics since the 2009 coup, as well as ongoing U.S. complicity, show a continuity of state sponsored terror, with new elements for the post-coup context. As U.S. President Ronald Reagan took office in January 1980, the Sandinista revolutionary government was in power in Nicaragua and revolutionary forces were struggling for political control in El Salvador. Honduras was undergoing its so-called transition to democracy with a return to civilian rule. The U.S., already supporting the Guatemalan military’s bloody counterinsurgency efforts for over a decade, played a key role in backing the counter-revolutionary factions of the political struggles gripping the region in civil war, namely Salvadoran government forces and the Nicaraguan Contras. While Honduras did not have a mass revolutionary guerrilla movement like its neighboring Central American countries, political opposition was criminalized to contain the threat of an armed, popular uprising. Much of this violent work was carried out through forced disappearances by the death squad Battalion 316, the special unit of the Honduran military responsible for political torture and assassinations, with the collaboration of other military branches, special forces, and police. According to the Honduran human rights organization COFADEH, formed in the 1980s by family members of the disappeared, Battalion 316 was responsible over 180 forced disappearances between 1980 and 1988, and many more were kidnapped and tortured. Forced disappearance refers to the practice of secretly abducting and murdering victims, making them disappear from society without a trace. Bodies of the disappeared are often carefully hidden, or rendered unrecognizable, to instil fear without the identity of the victim or the perpetrator becoming known..
Battalion 316’s terror was simultaneously covert and public, carried out by disguised agents at times in broad daylight, intended to instill fear and make an example of their victims. Suspected political dissidents were kidnapped, detained in secret jails, and tortured. Sometimes remains of victims were found in ditches. According to the Baltimore Sun expose, torture techniques included electric shock, suffocation, freezing temperatures, and psychological torture as part of interrogation, which sometimes involved CIA agents. Berta Oliva, director of the Committee of Relatives of the Disappeared in Honduras (COFADEH), has said that at least one prisoner was skinned alive in a clandestine Battalion 316 jail. While the numbers of people disappeared in Honduras was considerably less than in many other Latin American countries during the same period, the hundreds killed and disappeared created a broader fear and terror campaign that had the intended outcome of disempowering the Honduran left. According to Adrienne Pine, Professor of Anthropology at American University, it’s hard to overstate Battalion 316’s impact. Battalion 316, led in its most brutal years from 1982-1984 by School of the Americas and Argentine-trained head of the Honduran armed forces General Gustavo Alvarez Martinez, was a right-wing project designed to aid the Cold War fight against the alleged threat of communism in the region. Many Battalion agents were graduates of the U.S. School of the Americas (renamed in 2001 to the Western Hemisphere Institute for Security Cooperation) military training center for U.S. allies in Latin America, specializing in Cold War counterinsurgency training. The Battalion itself was trained and financed by the CIA. Meanwhile, Honduras received tens of millions of dollars in U.S. funding throughout the decade, reaching its height of US$77.4 million in 1984. The secret military unit also received training in Chile under dictator General Augusto Pinochet, as well as from Argentine counterinsurgency forces, at the time deep in their own dirty war against leftist dissidents that claimed some 30,000 victims in Argentina by early the 1980s. U.S. Ambassador under the Reagan Administration, John Negroponte, is documented to have met frequently with Battalion 316 leader Alvarez Martinez. However, the violence and human rights abuses perpetrated by Alvarez Martinez’s forces are conspicuously absent from the hundreds of cables of records of their correspondence. In 1983, the U.S. awarded Alvarez Martinez the Legion of Merit for “encouraging the success of democratic processes in Honduras,” exposing the true face of U.S. hypocrisy. U.S. denial of the violent situation in Honduras enabled the ongoing use of the country as a strategic U.S. military base from which to execute counterinsurgency strategy in the region, while the supposed threat of an armed insurgency in Honduras justified the existence of Battalion 316 and its terror. The post-coup links to Battalion 316 terror were palpable, both in the vast increase in human rights abuses, including torture, assassinations, and forced disappearances, as well as the direct connections of Battalion 316 personnel offering their expertise to the coup regime. Former head of the Battalion 316, School of the Americas graduate Billy Joya, became a prominent coup regime spokesperson, advisor, and aide to de facto president Roberto Micheletti. According to COFADEH, many other retired Battalion 316 agents also became government advisors. Pine, author of “Working Hard, Drinking Hard: On Violence and Survival in Honduras,” said that the numbers of state-sponsored disappearances, tortures, and extrajudicial killings since the coup have far exceeded those of the 1980s. With striking similarity to the fear campaign of the 1980s, COFADEH documented in 2010, along with dozens of other death threats and assassinations, that a former Battalion 316 agent publicly threatened resistance activist Candelario Reyes with forced disappearance and death, saying that killing such a “communist dog” would make the “best example” for other resistance activists. Harkening back to 1980s terror was a deliberate strategy to instil fear in perceived political threats. In 2012, COFADEH human rights defender Dina Meza received a series of threats of death and sexual violence by text message signed with the initials CAM, standing for Comando Alvarez Martinez, early 1980s head of Battalion 316 responsible for grave human rights abuses. According to Amnesty International, CAM was used as a pseudonym in numerous death threats against journalists and activists in the wake of the coup. According to Frank, an expert on human rights and U.S. foreign policy in Honduras, the clearest and most alarming examples of post-coup strategies that follow the model of Battalion 316 are the TIGRES special units of the police force and FUSINA inter-agency task forces that bring together military, police, military police, prosecutors, and other government officials under military control. FUSINA was initially headed by School of the Americas graduate Colonel German Alfaro, former commander of Battalion 15, the military unit in the Aguan Valley region implicated in dozens of post-coup murders of campesino activists. Trained by the FBI, DEA, and U.S. Marines, FUSINA is not only troubling for its conglomeration of agency functions under a military mandate, but also for its U.S.-enhanced intelligence capacities. These new constellations of state and military power, designed and deployed to create fear and contain political dissent, have again had a deep social and political impact in Honduras. But while there are clear continuities between the 1980s and post-coup strategies, there are also important differences. Despite the fact that the armed left was a very small faction in Honduras, particularly in comparison to the revolutionary uprising in neighboring countries, Battalion 316’s violence was committed in the name of counterinsurgency. As Frank explains, the broad based nature of the post-coup popular resistance means that the victims of extrajudicial killings and forced disappearances have been from a more diverse cross-section of society than the 1980s campaign against suspected revolutionary leftists. Now, with the pretext of an alleged communist armed struggle no longer relevant, post-coup repression, including use of these historical counterinsurgency tactics, and U.S.-backing of a violent regime is framed in different terms. And while the U.S. goal of maintaining a regional base of power amidst the threat of emerging or consolidating leftist alternatives remains much the same, the political context in the region has significantly changed. In the process, the U.S. also promotes the interests of transnational corporations that are making a killing from state-sponsored death squads that suppress resistance and pave the way for capitalist exploitation of land, labor, and indigenous and campesino resources. Bertha Oliva, director of COFADEH, lost her husband Tomas Nativi to forced disappearance by Battalion 316. Nativi was taken from their home by masked agents in 1981 and has never been seen again. Over the year after Nativi’s disappearance, Oliva came to realize that she was not alone, and others had similar experiences of family members being disappeared. In 1982, 12 of these families came together to form COFADEH with the clear objective of bringing back alive family members who had been disappeared. In the majority of cases throughout the 1980s while Battalion 316 was operating, COFADEH did not succeed in their goal. After the 1980s, COFADEH broadened its scope as an organization not only committed to seeking justice for the families of the disappeared and truth for Honduran society, but also representing and defending victims of human rights abuses, documenting cases, and providing training to raise awareness about human rights. COFADEH has continued to play a key role in documenting and denouncing human rights abuses and demanding justice, particularly once again in the years since the coup.